It’s true, with Western propagandistic headlines like this, who needs NATO, who really needs them as even friends. Perhaps the barrage of such vitriol has caused two vital allies of Washington, Ankara and Islamabad, to be fare more cautious from here on out. It was bad before in previous decades, but headlines like this – NOT in right wing cheerleaders of empire like Fox News – but in virtually all of the “Liberal media” (who consider themselves more sophisticated and nuanced), we see one ridiculous (and dangerous) headline after the next. It’s not Erdogan or Imran Khan per se who bother Western elites. It is what they represent: the de-centering of the West, the re-orienting of the world order, and the profound crisis and rapidly collapsing world system of the 500 year project of coloniality. The Erdogans, Khans, etc., In a nutshell, represent the irresolvable crises of ‘whiteness’ (in a world that is finally beginning to mentally decolonize from prostrating before the Western “White Man” – used here as a political category rather than merely a racial one). It is a crisis of that white supremacist world order, and a crisis of the post-WWII liberal international order that Western hegemony thought it could dominate endlessly – all culminating now in the relative structural decline of the Western plutocracies. Of course, the leading American politicos and financiers fully grasp this situation but keep getting convinced by the warmongering neocons and Zionists in Washington DC that the Empire can reverse its decline by reckless threats and flexing its military muscle. Or, if that doesn’t work, learn from the German and Italian leaders of the 1930s about how to deal with the ‘Muslim Question’. Indeed, headlines like this infantile one reflect that. They have become indistinguishable from any utter nonsense one may expect from many one-man, one-party, and one-media kind of states (many of which are close allies of Washington), something to be reflexively dismissed because everyone knows it’s pure state propaganda. And in the headline referred to here, the mythology we are expected to swallow is just too insulting to our intelligence. Erdogan and the AKP were the first forces ever to make overtures to the Kurds, to both integrate them and grant them autonomy. In fact, Turkey’s worst crimes against the Kurds peaked in the 1990s with complete military and political support from Washington. 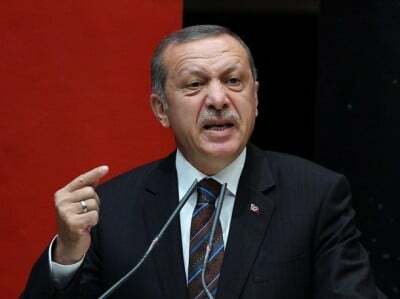 A decade ago, Erdogan and the AKP were ‘NATO’s Islamists’ and promoted as a model for the Muslim world, repeated ad nauseum by every Western think tank. So yes, the Kurds have been treated horribly by the state of Turkey, but that is a long history of secular military repression long preceding Erdogan and the AKP party that initially tried to ameliorate the conflict. The Saudis in particular are aching to punish Erdogan since he made sure that the Saudis would not just run roughshod and take over Qatar, since Turkey sent its troops immediately to defend Qatar from the Saudi invasion. After all, the House of Saud believes that the GCC (Gulf Cooperation Council) and indeed all Muslim nations exist to serve them and their interests alone. They are – or at least claim to be – the custodians of the two holy mosques and Islam more generally, so the House of Saud expects a default genuflection to its tyranny by all Muslims of the world. Fortunately, that is the fictitious fantasy land of the ‘reformer’ Crown Prince Mohammad Bin Salman (MBS), whose wet dreams undoubtedly are instigated by the smile on his face knowing Yemenis, Gazans, etc. are being butchered. MBS should know not let his feelings get hurt by the fact that overwhelming majority of the Muslims throughout the world only care to visit or even think of Saudi Arabia when it comes to performing their mandatory religious ritual of Hajj (pilgrimage). Other than that, they see the House of Saud as the curse upon the Muslim world that it is, always on the side of oppression and subjugation, and ingratiating itself with its protectors in Washington at whatever price demanded. The Emiratis play the exact same game. It is incredulous that in light of the criminal wars and humanitarian catastrophes in Yemen, Gaza, and at the US-Mexico border where entire families are being ripped apart, the Western plutocracies and their media are involved in the most vulgar hypocrisy imaginable – when it comes the ‘non-West,’ the ‘non-White,’ and especially, the Muslim. Nevertheless, we must never forget the courage of the many in the West resisting the creeping fascism that their elites are trying to impose on them and the world. Junaid S. Ahmad is a PhD Candidate in Decolonial Thought, School of Sociology, University of Leeds, a Research Fellow, Center for Islam and Global Affairs (CIGA), Istanbul, and Director of the Center for Global Studies, School of Advanced Studies, UMT, Lahore, Pakistan.